In the seventh century, the Christian Church in England was in a fluid state and divided into different factions. The divisions were settled by two great synods, described by the Venerable Bede: one in 664 at Whitby, and the other in 673 at “Herutford”. Although the location of this second synod is disputed, it seems most likely that it was at Hertford. Britain had become officially Christian with the rest of the Roman Empire under Constantine the Great in the early fourth century. However, after Britain ceased to be a province of the Empire in 410, Roman authority was gradually replaced by warlords of the Angles, Saxons, Jutes and Frisians. Although it seems probable that much of the population remained the same, they adopted the language and customs of their new lords, just as they’d previously adopted the language and customs of the Romans - and this included their pagan religion. Britain was reconverted to Christianity from two sources. Irish monks, such as St Columba, brought the religion over to Scotland, with their successors, such as Aidan and Cuthbert, spreading south and converting the powerful kingdom of Northumbria. These followed the customs and doctrines established in Ireland by St Patrick, which had developed through little contact with Rome into the Celtic Church. In 595, Pope Gregory the Great sent St Augustine on a mission to Britain at the invitation of Bertha, Queen of Kent. She was a Frankish Christian, and with her help Augustine succeeded in converting the King and establishing himself as the first Archbishop of Canterbury. Augustine’s strictly Roman church spread north and west, until eventually the two versions of Christianity met in the middle of the country. Augustine’s strictly Roman church spread north and west, until eventually the two versions of Christianity met in the middle of the country. The situation, though, was far from straightforward. The Kingdom of the East Saxons, for instance, which then included much of what was to become Hertfordshire, was converted by the Roman Church, reverted to paganism, and was then reconverted by the Celtic Church under King Sigebert, who had close ties with Northumbria. In 664, the Synod of Whitby was summoned, where Celtic and Roman bishops debated the issues that divided them. This focused heavily on the date of Easter, the Celtic Church preferring to calculate it in the same way as the Jewish feast of Passover, the Roman Church using the method we have today (the first Sunday after the first full moon after the vernal equinox). Eventually, the Roman method was agreed, and most importantly the King of Northumbria agreed that the Church in his kingdom would be run according to Roman rules. 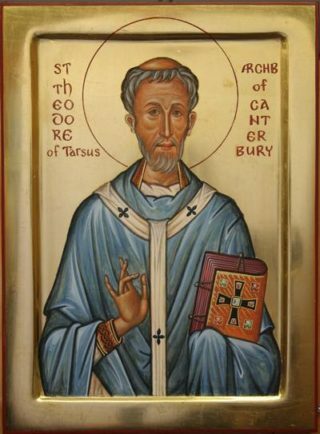 Following this, the Pope appointed Theodore of Tarsus as Archbishop of Canterbury, recognising him as Primate of All England. * However, although Whitby had brought unity to the English Church, it was largely an agreement in principle. The details still needed to be hammered out. Nine years later, Theodore summoned a second synod at a place named by Bede as “Herutford”. Some historians have disputed that this could have been Hertford, pointing out that there’s no evidence the site was inhabited at the time and suggesting instead the village of Hartford in Huntingdonshire (now Cambridgeshire). On the other hand, Hertford had been a Roman settlement and was soon to become a Saxon settlement. It’s not impossible that the Roman buildings may have survived to the seventh century, or perhaps the Saxon settlement at Foxholes had already begun by then. More importantly, it was a convenient and strategic location. It lay at the junction between two Roman roads (one of them the all-important Ermine Street) which would still have been the main arteries of travel at the time, as well as being easily accessible by river. It also lay on the border between two of the most powerful kingdoms, the East Saxons and the Mercians. Although it’s impossible to be sure, there seems no reason to dismiss Hertford as a likely location. According to Bede, the object of the synod was “to enjoin the observance of such things as were agreeable to the unity and the peace of the church” and “to render all the churches in England conformable to the custom and authority of the Papal See”. Besides Theodore, it was attended by bishops from Kent, Wessex and Mercia, as well as representatives from East Anglia and Northumbria and two kings from the East Saxons. The synod agreed on ten rules or canons that formed the fundamental governance of the church. 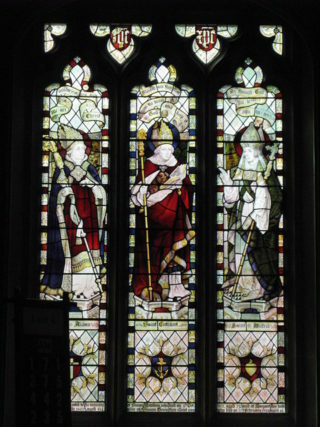 Besides confirming the Whitby decision about Easter, these included prohibiting the remarriage of divorced people during the former spouse’s lifetime; the authority and limitations of bishops within their dioceses were agreed; all agreed to acknowledge the supremacy within England of the see of Canterbury; and provision was made for future synods to be summoned. Theodore laid down that these canons must be followed, on pain of excommunication. The nine-year period that began at Whitby and ended at Herutford was perhaps the most crucial for defining the English Church until Henry VIII’s reforms, and arguably more fundamental than those. It seems strange that the Synod of Hertford isn’t better known, although that might be partly to do with doubts over the location. However, that didn’t prevent it from being commemorated in the great Hertford Pageant of 1914, and again on the 1300th anniversary in 1973, when two commemorative stones were unveiled. In spite of the doubts, this is one more of the many historical events that Hertford can be proud of. * Rather confusingly, the Archbishop of York is styled Primate of England and the Archbishop of Canterbury Primate of All England.